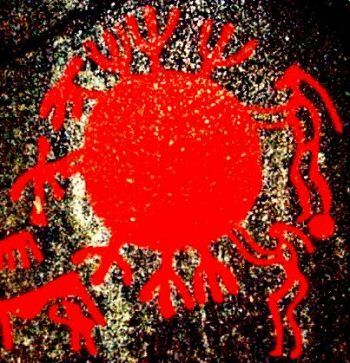 dating rock art with solar eclipses ? We review several aspect of the human perception of solar eclipses, total & annular, in ancient & pre-historical Art, in China & other places . 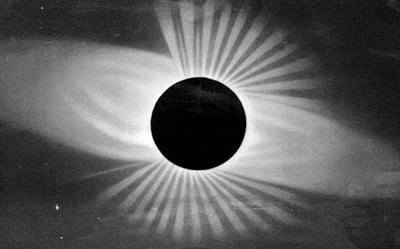 Several candidates for representation of solar eclipses are compared with the various actual appearances of this natural phenomenon. 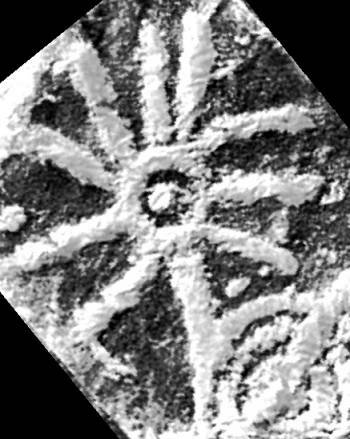 Finally, attempts of dating such Rock Art, with engraved drawings representing an eclipsed Sun, are presented. We discuss errors resulting from the use of methods based on celestial mechanics for dating pre-historical solar eclipses. to date it, by scanning all the retro-predicted candidates, a kind of qualified guessing appears as a promising method. ii) to provide a compatibility criterion to select candidates. Some examples of lithic engravings possibly depicting a solar eclipse will be discussed. As everyone should know, the observation of the sun with naked eyes might induce very severe ophthalmologic problems (though, the amount of light of the eclipsed sun, during totality, is no more than the one of the full moon). In fact, we do not know how many people have lost their vision (totally or only partially) in the past. During totality, bright stars are becoming visible. 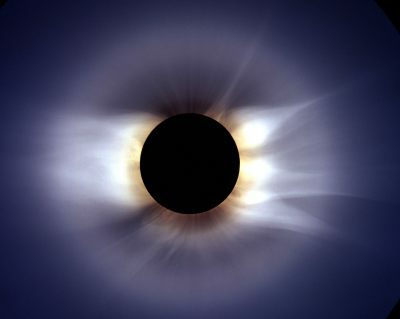 While naked eyes observation of a total solar eclipse is straightforward, equivalent photographic imaging requests radial filtering or the processing of a composite out of the shots taken with varying exposures. Christian Viladrich (Institut d'Astrophysique de Paris) built such a computer assisted mosaic out of 8 shots he took on 26. Febr. 1998 of the eclipse over the Guadeloupe Island, which can be downloaded (590 Ko). On this amazing picture, the lunar disk, lighted by earthshine, has been enhanced and the magnitude of the stars is indicated. 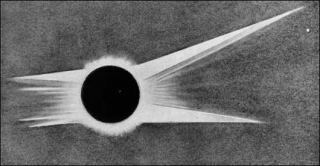 According to J. Eddy, this is the 1st record of a CME (Coronal Mass Ejection). One of us (SK) did visually observe the corona during the 7 minutes long totality of this eclipse. and the coronal structures, i.e. : the so-called helmet streamers and the long streamers with open stalk. i.e., as long as, or even longer than, the length seen on the photographic picture. up to a distance from the sun of at least one solar diameter. 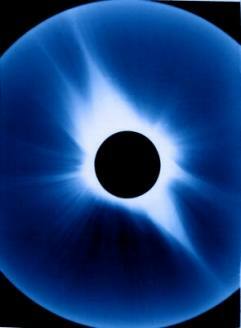 H. Tanabe & H. Shibayama, with 4 other contributors, took part in an experiment "Sketches of the Solar Corona" in real time. Those 3 pictures illustrate well the differences between photographic and eye-brain system recordings. 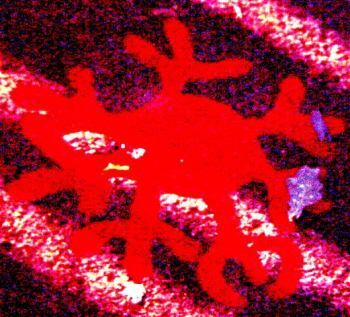 (particularly if only a reflected image on a water surface is looked at), compared with full direct sunlight. 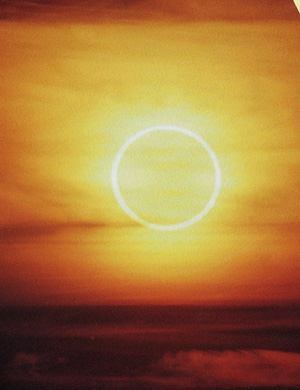 Annular eclipses do not allow the observation of the solar corona, but such events remain impressive. and has been reviewed in-depth by F. R. Stephenson, in Historical Eclipses and Earth's Rotation, Cambridge Univ. Press 1997 . One selects the observation site of his choice by giving in its longitude and latitude, and a starting date. (in this process, the programme assumes a certain deceleration of the Earth). reference data set of historically reliable solar eclipses. 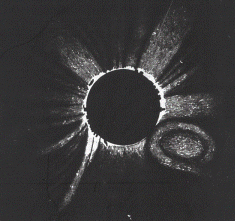 how to evaluate the reliability of the record of the observation of an ancient eclipse ? or, as we will see, eclipses whose argued sites of observation contradict the analysis of the reference data set. (a critical selection of the eclipses reported in) the Chinese Annals. as the eclipse over Chang'an (Xian), on March 4th, -180. Their result is D T = 3.4 h.
the time span to be considered for the occurrence of an eclipse might be large. has been discussed in 1989 by Xu Zhentao, K.K. Yau & F. Richard Stephenson, in Archaeoastronomy #14, S71. but contradictory interpretations cannot be discarded. i.e. : from -1'600 to -1'050. this leaves room to several candidates ! in GeoResearch Forum 3-4, 1998, pp. 459-488. (6 minutes), which occurred on 5 June –1301. properly extracted, organic carbon of the collagen of this very tortoise-shell (serial # 13.0.13510). c being expressed in units of "seconds per century, per century" [ s . cy-2]. Below are listed five ancient eclipses supposedly reported in Chinese Annals, and the check we made with EMAPWIN. to check the plausibility of ancient eclipses at a given observation site. Nevertheless a +/- 8% represent pretty broad limits. 1. 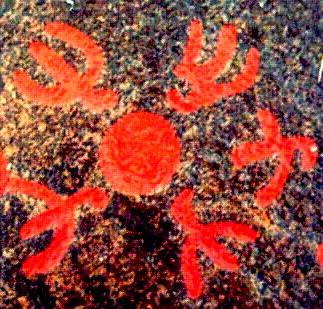 A Swiss astronomer, W. Brunner suggested that the rock engravings in the County of Tanum (in Sweden) were depicting the same solar eclipse, The one of 23. October -1067. One could argue that the bronze age style of the engravings is compatible with an earlier date. From the design style, we would well see in those engravings the depiction of an annular eclipse, i.e. the one of 12 March -1361, though there are other eclipses compatible with Pang's criterion. 2. 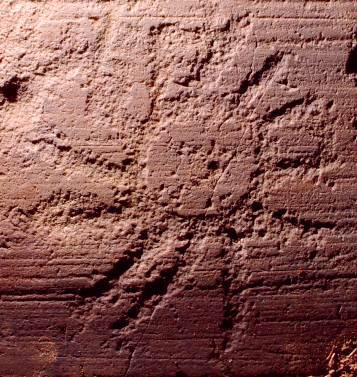 The Swiss astronomer, W. Brunner suggested that the rock engravings in Carshenna (Switzerland) and Coren del Valento in Valcamonica (Italy) represent the total solar eclipse of 13 July -884. This eclipse does only marginally satisfy Pang's criterion. In addition, it contradicts the archaeological context. The Bronze age style of those engravings call for a quite earlier date. Our best alternate candidate is 15 November -1430. 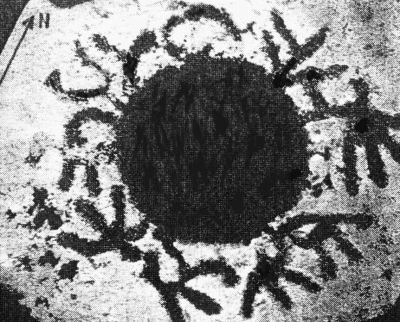 Those preliminary results for dating Rock Art & lithic engravings with solar eclipses confirm our expectations in the potential of this "reverse method", where, instead of trying to date an eclipse in order to measure the slowing down of Earth rotation, one uses the values of this rate, what we call the "Pang's criterion", to establish the plausibility of the date of a solar eclipse. of World Annals are compatible with a simple parabolic Model of the slowing down of Earth's spin . Acknowledgement: One of us (LD) would like to thank here Dr Xu Zhentao for his kind help, and Dr K. Pang for his most useful comments on his work.